I must address a troubling issue. It is vitally important and may very well cure cancer, solve world hunger, and bring peace to our people. How often do you wash your towels? The ones you use after you bathe. Those towels. Some people wash them after a use or two. I urge you to give serious thought to the events that transpire before you answer this critical question. You've just come out of the tub or shower. Your entire purpose in there was to clean your hair and/or body. Clean....as in no dirt, no sweat, no nothin' except.....well, cleanliness. You step out, dripping with clean water and dry yourself with a towel. The towel isn't dirty afterward, just a little wet. It'll dry.....but it'll still be clean because you left all the dirt and other crap behind to go down the drain and out into the world. It isn't on you anymore, therefore and ergo, it won't be on the towel when you're done, right? Which means the towel itself isn't dirty because you can't transfer something you don't have. Since the towel is still clean, there's no need to wash it. Am I right? Never mind....I know I am. And yet, people want to wash them anyway. Granted, they probably have dust or dead skin cells or bug parts (or whatever else floats around in the air) on them, but that would happen when they're sitting in the linen closet too. If you want clean (completely, totally, really clean) towels to dry yourself with, you should wash it immediately before you bathe, run it through the clothes dryer, then dry yourself. I'll admit, warm towels out of the dryer are pretty nice, but it sounds like a lot of work to me. 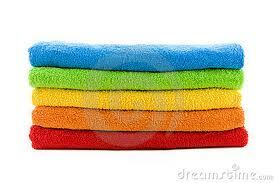 However, if you insist on towels at the apex of their cleanliness cycle, that's the way to do it. I'm pretty sure that the CDC or FDA or someone has done a study that confirms this. The other bathroom decision has to do with toilet paper, but truly, that's a no-brainer. It goes over, not under, for those of you who may be sadly unaware. Then all you have to do is kinda whack the roll on the top and -- voila! -- toilet paper, unrolled and ready for business. You know....your business. How often do you wash your towels? Do you, or someone you know and love, think that they are dirty after a use or two? That said, I used to use my towels a time or two before tossing them in the wash, however, my neatnic husband washes them after one use, and since he does the laundry. I am thinking that maybe some kind of bacteria grow on them? Weekly...um, if I remember...which I don't always. [Sheepish expression] They rarely get to the 'smelling bad stage', though! Once a week usually. I agree with you...you are wiping a clean body...why wash the towel every time? I have had this argument with my daughter.. why do you wash towels after every shower?? And for my grandkids who are not large and one is a male with short hair...why do you have to use two towels????? I change out wash cloths more often, they get stiff and hard fast. You are my new best friend. I have been known to secretly turn tp rolls around in other bathrooms hehehehe. Over not under!! You can't find the edge the under way and also if you roll it, 20 sheets unroll before you know it. What a pain. Very true! Too many people are wasting water washing their bath towels after every use. Thank you for proving I'm not crazy when it comes to my TP! Yessiree - I agree. After standing under running water for 20 minutes and draining a 60 gal water tank one should be clean. My OCP friend shudders at my second-use towel, lol. As for the toilet paper, I prefer it as you do - easy and quick. Things were different when a cat owned us - the paper had to be under cuz more than once I awoke in the night to hear the roll spinning a 100 mph and finding 80 yds of paper piled, half shredded, on the floor in the morning. Yes, I have also been there ! My entire family think that towels need washing after one wipe. I regularly retrieve them from the wash, hang them on the line and then restock the towel shelves. Less washing. I am all for time saving/money saving tips. You can also wear your underwear one day and then turn it inside out for the next day. But that's another story.